1. Start with some eye shadow primer on the lids, which prevents creasing and intensifies the colour of your products overtop. 2. Apply a neutral, shimmery shade to the entire lid, blending from the inner corner, up to the eye crease. 3. Blend darker shades only into the crease and around the outer corner. Pick up a small amount of powder onto a fluffy brush and perform windshield wiper motions from the outer corner of your eye, towards the front of your brow bone, a bit below the fluffiest part of your eyebrows. 4. Carefully sweep a dark black shadow or eyeliner onto the upper lash line. Get as close to the eyelashes as you can for the most natural effect. 5. Bring the excess shadow left on your liner brush onto the lower lash line, only applying the colour to the outer half of the lower lashes. 6. Curl lashes. Hold for a few seconds at the very base of the lashes, then clamp again a bit further up the lashes. 7. Apply your favourite mascara. Get right close to the base of the lashes, and brush upwards. I don't apply product to my lower lashes to maintain a fresh and minimal appearance. 8. Sweep on a bit of cream highlighter to the brow bone and cheekbones. This is a great example of where less is truly more. Highlighter, which is just a shimmery powder or cream, looks best when used in very minimal amounts. Focus on the area right under the arch of your brows, and on the highest points of your cheekbones, almost up to the outer corner of your eyes. 9. See my detailed review of the TooFaced Boudoir Eyeshadow palette here. I finished off the look by filling in my brows with a brow powder, sweeping on some natural pink lipstick, and spritzing a bit of makeup setting spray to lock everything in. 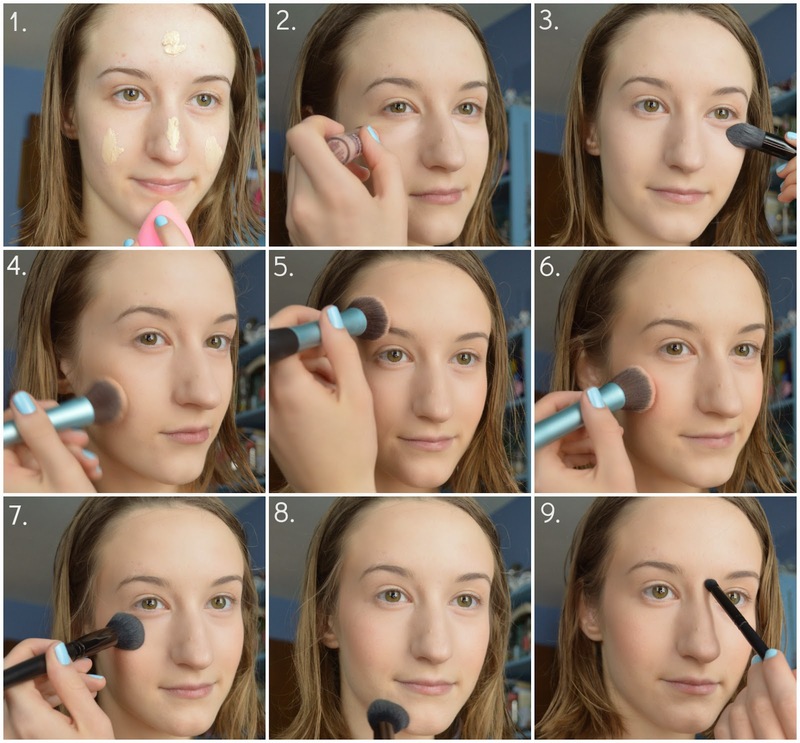 I hope this detailed routine gave you some tips on how to apply makeup onto your own stunning visage. It has truly taken me years to perfect my everyday makeup look, which is still being improved as I continue to experiment with new products. Always apply makeup in natural lighting and don't get too close to the mirror. Turn your face from side to side to see what the application looks like in real life. Finally, be sure to blend your base product onto the neck and around the jawbone to avoid that horrific mask line. Remember that you don't need makeup to feel your best. Love your skin and treat it with care to avoid piling on heavy foundation, which will do far more harm than good. Everyone loves you in your most natural state.